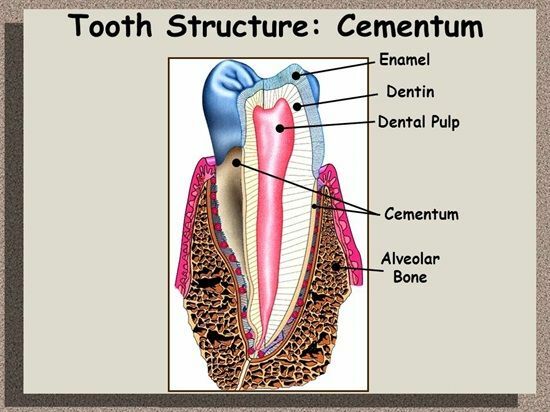 Summary: Difference Between Alveolar Bone and Cementum is that Alveolar bone is the alveolar process of the jaws that forms and supports the sockets for the teeth. They develop during the eruption of the teeth and disappear after the tooth is extracted or lost. While cementum is comparable to bone in its proportion of inorganic to organic constituents and to similarities in its structure. The cementum is thinnest at its junction with the enamel and thickest at the apex. Alveolar bone is the alveolar process of the jaws that forms and supports the sockets for the teeth. They develop during the eruption of the teeth and disappear after the tooth is extracted or lost. The basic structure of the alveolar bone is very similar to the bone found elsewhere, except for the presence of immature bundle bone amidst the compact bone lining the sockets for the teeth. The buccal and lingual plates of compact bone enclose the cancellous bone. The arrangement and the density of the cancellous bone varies in the upper and lower jaws and is related to the masticatory load, the tooth receives. The ability of bone, but not cementum, to form under tension and resorb under pressure makes orthodontic treatment possible.